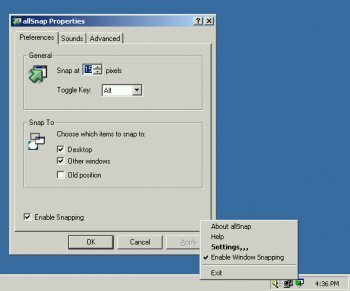 allSnap is a small system tray program that causes all top level windows to snap to the sides of the screen and each other while moving or sizing. Excellent program. Very helpful if you often have several windows on the screen that you need to juggle around - like a notepad and a browser for example. Also, the "constrain to screen" option is excellent and means that it will disallow windows from moving off the screen so you don't need to be as careful when dragging. Pretty much just set and forget. @jongliko2: NiftyWindows is definitely cool too, but as far as I can tell, NW only allows you to snap to a predefined windows grid. AllSnap does this as well, but it also allows you to snap to the sides of other windows as WELL as allowing snap-to-grid, and doesn't require you to hold down a key as well while doing it. I just discovered it and I like this simple little utility. I think Betanews need to update this download, though, since they have a new version. Is it Irony when 14 year olds with IQ's of 92 call everyone else on here a retard? Its certainly funny as hell when someone who does not yet know the different between 'their', 'there' and 'they're' calls me a retard. By the way this program is cool, works fine. No complaints w/ the last one, and I've been using it for months. Doesn't snap certain windows like the cmd prompt, but what it does, it does very well. Such a simple idea... yet so powerful! It's very retarded for anyone to rate this with a low score if they are using GUI/Theme programs which override this program and any of it's features, or use an operating system which is an upgrade to Windows 98 which isn't even capable of running such a program. These reviews should be deleted. Spite those reviews, this program does exactly what it's meant to do. It really adds some organization to your desktop and helps a whole lot if you do alot on your computer and need to keep some sanity on your desktop. IMO, best prog for a window-snap solution. Keep up the good work, look forward to future releases. It does what it does well, and better than any other integrated window snapper in any app I've used (like... just for that app. Like Winamp or Steam. Excellent program, I've been using it under 2000 and XP since it was released. It fixes what I feel to be a major problem with the windows GUI and it does it well. Nope!!! Still does nothing in Windows Me. I messed with all the settings, and it doesn't do anything. I've used this program in both Windows 2000 and Windows XP Pro and absolutely love it. It does everything it claims to do, and since I am such a neat freak I really like the fact that it allows me to lay out my windows on my desktop exactly as I want them and remembers there position every time (even those that don't ordinarily allow such tweaking), the snap feature is fantastic. My 2 cents.